The list of CDAC’s Post Graduate Diploma courses and their eligibility criteria is given in Table 1. Details of these courses are given in Section 17 of this Admission Booklet. C-DAC’s PG Diploma courses are full-time courses of 24-week duration. The fee for all PG Diploma courses (except PG-DBDA) is Rs. 90,000/- + Goods & Services Tax (GST) on it as applicable at the time of payments. The fee for PG Diploma in Big Data Analytics is Rs 1.15 lakh + GST. Graduate in Engineering or equivalent (e.g. BE / BTech / 4-year BSc Engg / AMIE / DoEACC B Level) in IT / Computer Science / Electronics / Telecommunications / Electrical / Instrumentation. In addition to the common eligibility criteria given above, candidates with the course-specific qualifications mentioned in Table 1 are ALSO ELIGIBLE for the particular courses. Minimum percentage of marks required in the qualifying examination is also stated in Table 1. The minimum percentage of marks will be considered as per the norms of the university from where the candidate has graduated. C-DAC’s PG Diploma courses, their fees and eligibility criteria. Course Code Course Name Eligibility Min. 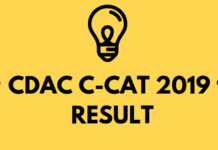 Proof of having passed the qualifying degree with at least the required minimum marks shall be submitted at C-DAC by 31 May 2019. Note: Candidates are required to ensure that they meet the eligibility criteria of the courses for which they are applying. In case a candidate is found to be non-eligible during any stage of the admission process or course delivery, his/her admission will be cancelled with immediate effect. The penalty clauses as given in the sectionCancellation & Refund will be applied to such candidates. which is the “qualifying exam” mentioned in the article? %age criteria is only for the Final year exam or aggregate of 4 yrs of engineering? I am pursuing my MCA final year. Only results are remaining. so can I appear for c-DAC exam. One thing I want to ask is that what is difference between C-DAC and C-CAT. If you get back your answer, do tell me too. Hello sir i am graduate from b tech biotechnology can i apply for c-dac? I am mechanical engineer2018 but result of 8 semester is not located. Can I apply for c-dac.?? sir,i am completed computer engineering recently can i eligible to apply for c-dac.? I’ve got 10 = 87.4% , 12 = 67% , B.Tech = 88.4% , 1 year gap and B.tech Mech. Engg. but I am deeply interested in IT jobs. I want to select my center on the basis of good faculty and placements.My preferences for CDAC centers as of now is as follows. Just wanted to know if any changes required in the following choice of centers. No you made better order and Best wishes to you. m I eligible for post graduate diploma in embedded system design CDAC? In addition to the common eligibility criteria given above, candidates with the course specific qualifications mentioned in Table 1 are ALSO ELIGIBLE for the particular courses. Minimum percentage of marks required in the qualifying examination is also stated. The minimum percentage of marks will be considered as per the norms of the university from where the candidate has graduated. The eligibility is Btech or Pg in science or engg. if you have cleared all your backlogs then you’re eligible for the course. Yes, you are eligible as there is no percentage criteria. i got 49% am i elligible. I am 45 years old and working with the Railways as sr section engr. I’m eligible to take c Dac. But want to know that if it would be beneficial to do it. I want to change my organization.i have 15 yrs of experience. From the purpose of education it is beneficial. But from point of placement there might be issue as age may create problems. I have completed my graduation from pune university in electronics engineering with aggregate of 54%. can i apply for CDAC and also looking at my B.E. percentage will i get placed after completing CDAC with good score?? Can i apply for the CDAC course? My brother recently finished his BCA. Is he eligible to take PG-DBDA at CDAC. Hey sorry to say but he is not eligible for PG-DBDA as he needs to pursue MCA for it. hello I am mechanical engg and I am passout in 2015 . If done pg here then can I got placed in IT . Hello sir, i have completed my b.tech in a stream of computer science engineering so can i apply for this course. Need to know is their any fee concession for PG-DAC for OBC category ? if yes then how much ? need to knw about the admission form..? The form will be available by Oct-Nov as the exam will be conducted in December (for February admissions). You need to wait till the application form be to released. Sorry but graduation is the minimum eligibility criteria. Which course is suitable for me?? I am completed mechanical engineering in 2017. Which course is suitable for me??? Can i eligble for this course cdac if yes so suggest me if it is not to please suggest any better course for my career. Sorry,but are not eligible for CDAC but do look for other opportunities. Hello sir, I am 2014 (entc) passout. I have 2years of experience in non it feild can I apply for cdac (vlsi or embedded)?? Is it beneficial for me or not?? can final year BE student are eligible for c-CAT ? sir i have completed my BE(66.06) in 2017(E&TC) and now i want to do cdac so at the time of placement my year of passing will cause any problem ?and i have done both 12th(50.17) and diploma (78.19) so will these things create any problem at the time of placement. and i want to take admission for cdac feb 2019 so will my pass out year and my 12th and diploma will cause any problem at the time of my placement . Hello sir, i have completed my BE(E&TC-66.06) in 2017 and i have also done both 12th (50.17) and diploma (78.19) and i want to take addmission for cdac (feb -2019) so will my year of passing and my 12th and diploma will cause any problem at the time of placement . HI SIR. One of my friend completed her education in ENTC and wants to do CDAC in artificical intelligence but while searching for the same course coaching in pune no one institute I found. so if you know any anything about it can you please inform me. You can check the Eligibility for it. I am doing BCS ..TO BE ELIGIBLE IN FUTURE SHOULD I GO FOR MCS or MCA. I’m b.tech student actually my course is 3and half year class room course and last semester is fully for internship.so I’m eligible for it or not? just wanted to know if a graduate in Bsc.IT is eligible for cdac courses? m doing b.tech..i hv given 8th sem..i hv backlog ..my 7th sem will be complete in december..am I eligible? registration closing date is near..should I register now? currently i’m pursuing b.tech…i hv given 8th sem but due to backlog i hv to give 7th sem..my 7th sem will cmplete in december.. Am i eligible? Hi sir i’m Abhishek shukla and i have done my B-Tech in mechanical Eng…so can i apply the c-DAC…..
Hi team, this is Sonali. I have completed B.E in computers and currently working, am I eligible for c dac diploma. What all languages you will be covering in the course. Are you going to provide job on successful completion of the course. I am in 2nd year of btech in comp engi. When i wll be eligible for cdac entrance ? You are not eligible for CDAC entrance. Hi sir, I have completed in BE computer engineering 2018 batch. CGPA: 6.85. Can I apply for C-DAC.? Can I pay the total fees through debit card for PG – DAC? Hi sir, I completed BE in electronics in 2015 and 6 Months Embedded System course. I have 3 year experience in electronics field. Can I apply for C-DAC for full stack development? yes you can apply for CDAC. Hi sir ,i am from ec branch and i m in final year so am i eligible to fill the cdac form. Hi sir i got 65% in 10th, 5.95 in B. E but i got 48%in 12th. So my 12th marks can make any problem in cdac admission process. hey sorry need the minimum 60% in your previous academics. yes, you can apply for the form. No, you cannot apply for C-DAC. Hi sir I’m a mechatronics engineer graduate , am i eligible for cdac courses? Is anyone get pgdiot Bangalore in cdac? M.B.A in IT of Yashwantrao Chavan Maharashtra open university Will be OK for eligibility of C_DAC ? I have 5 CGPA in BTech Mumbai University. Can I apply?? Sry but as per the eligibility criteria, you are not eligible. Hi sir ,I complete BE in winter 2018,but I have 4 year gap in be,so I apply for cdac course ,placement is provided??? yes you can apply for that. I’m pursuing Btech in computer science and I’m in final year right now and my btech percentage is 64 (till 7th sem). So can i apply for data analytics course.? Hi sir I’m pursuing computer science n engg (BE). In july2019 i will take admission for final year so can I apply for cdac n predac..
after completion of your Btech you can apply for that. Hello sir, I have completed my BE in 2017batch with distinctions.can I take admission for cdac in this year? You can fill the application form. I am persuing BCA second year. Will complete my BCA in 2020. Am I eligible for CDAC Diploma courses. Please guide me. 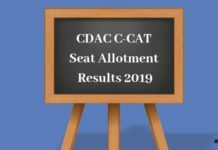 yes, you will be eligible for CDAC 2020. Yes, you can and you’re eligible also. you are eligible to fill the form. Sir i am civil engineering student .. this year my degree will be over .. should i join for CDAC..
Hi Sir , i am a bcom student and simultaneously doing Graduation course in computer Software and hardware, am i eligible for Cdac ? Hii sir, i have completed BE from mechanical in 2018.can i apply for cdac. (50 or 55%) required in all academic or only graduation. Sorry but u are not eligible to apply. Hi Sir, I have completed BCS in 2018 so can I eligible for PG-DITISS. Hello sir i am graduate from bsc comp.science in 3 year degree cab i apply for cdac? Hello sir i want to apply for DAC and im a graduate in mechanical engg(2014-18)…can i apply for it?? yes, you are eligible to apply for DAC. Hiii Sir, I have completed Graduation in BSC. Only engineering students apply for this. Hello, Im Btech with 54.3 % so can I apply for CDAC? Yes, You can apply as 50% is must. Hi sir, i im nikhil zope , passed out student 2018 batch completed BE- Electrical. Can i eligible for cdac? yes, you can eligible for this.